Using “standard demographic principles of inflow and outflow” and applying the best available and newest data for the period studied, authors Mohammad M. Fazel-Zarandi, Jonathan S. Feinstein and Edward H. Kaplan arrived at a conservative estimate of 16.7 million illegal immigrants in the U.S. for 2016, and a mean estimate of 22.1 million. To grassroots immigration skeptics, however, the study’s findings are consistent with their own informal, from-the-front observations. How, immigration critics wonder, could the illegal alien population remain fixed for years at roughly 11 million? The static number certainly seems questionable, given that for decades Republican and Democratic administrations alike have tolerated loose borders, endorsed catch and release, and discouraged interior enforcement. Whether the illegal immigration population is 11 million, 22 million, somewhere in between or even more, the large number of additional people has a direct effect on U.S. jobs and, rarely discussed, the fragile American environment. Illegal immigrants, we are often told, come to the U.S. in pursuit of a better life. That generally means adopting an American lifestyle, which is highly consumptive. More people in the U.S. means more consumption and more development. Natural habitat is increasingly lost for more housing, highways, schools, hospitals, stores, restaurants, offices, roads, parking, waste and all the other infrastructure needed by ever-more people. Ultimately, more growth in America means more sprawl and less open space, which means less biodiversity. Since the first Earth Day in 1970, celebrated during President Nixon’s first term, the U.S. population has increased from 203 million to nearly 329 million in 2018. 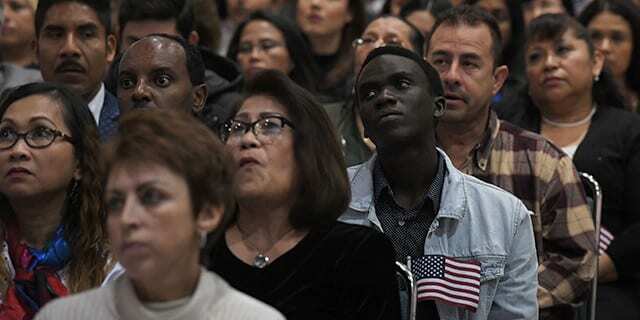 Looking ahead, the Pew Research Center projects that the U.S. population will reach 441 million by 2065, 88 percent fueled by immigration and births to immigrants. Two Oregon State University scholars, Paul Murtaugh and Michael Schlax, co-authored a groundbreaking study, “Reproduction and the Carbon Legacies of Individuals,” that added an important perspective to the immigration debate. According to the research of Murtaugh and Schlax, the average carbon footprint of a Mexico resident is 3.67 tons per year; in the U.S., it’s 20.18 tons. Approximately 5.6 million Mexican illegal immigrants currently reside in the U.S. If humans are indeed the major climate change driver, then logic dictates the solution is fewer people in a country with a high carbon footprint and not more. The Murtaugh-Schlax study demonstrated that a family choosing to reduce the number of children by one could achieve a lifetime CO2 emissions savings of 9,441 metric tons. Contrast this to that same family electing to increase their car’s fuel economy from 20 to 30 mpg. Improving mpg would result in a savings of only 148 metric tons. It should be obvious that no amount of recycling, energy efficiency or smart growth will restore America to a sound, sustainable place environmentally. Joe Guzzardi is a Progressives for Immigration Reform analyst who has written about immigration and population for more than 30 years. Contact him at jguzzardi@pfirdc.org. This entry was posted in Immigration Issues, labor. Bookmark the permalink.